Mark knew he could keep arguing until it was too late to go, but then his mother would be in even worse of a mood. With a defeated sigh, he took as much time as he dared to take his jacket off the moving box, then sauntered out to the car. During the drive, Mark sat in a sullen silence. His mother gave up on trying to engage him in conversation for the five minutes it took to get to the park. As they pulled into the small lot, she pointed out into the field. Mark looked at her doubtfully but got out of the car anyway. Then he turned to her. Mark started to object but realized that it was useless. Instead, he turned towards the group of boys, half-hoping that they would ignore him. He waited for the game to slow down a bit, then called out. Mark looked around and noticed the woods. There should be a few branches there that he could use as swords. He went over and looked around. He found a stick on the ground that was about the right length to be a sword. He picked it up and went back. “I found a sword.” He held the stick up triumphantly. The boys started swinging their swords again, ignoring Mark completely. He turned back to the woods. Since he couldn’t play with the boys and he wasn’t sure how to get to his new home from here, he decided to explore the woods. Mark didn’t know much about woods, other than that they had trees, flowers, and maybe some deer. He knew from watching movies that some had bandits, but he didn’t think that there would be any bandits here. But if there were, maybe they would let him join them. Then the boys would have to let him play with them, right? As Mark wandered the woods, he daydreamed about joining with a group of bandits. They would teach him how to use a bow and arrow. That would be much better than a sword because you can shoot someone who can’t hit you back. He imagined firing arrows while the other boys waved their swords at him. Reality reasserted itself when he tripped on an oddly shaped rock. Mark picked himself up off the ground. He looked at the rock closer and saw that it looked more like a skull with something sticking out of it. An even closer look and he could barely believe his eyes as he saw a sword sticking out of the top of the skull. He looked back towards the boys in the park. Now, this was a real sword. No way they could stop him from playing now. He dropped the branch that he was still carrying and grabbed the handle of the sword. It was freezing cold, and rough with pieces of stone. It was also firmly stuck through the skull and into the ground below. He pulled harder, but it wouldn’t move. Crestfallen, Mark tried shaking it, hoping the side-to-side motion would loosen it. It didn’t. 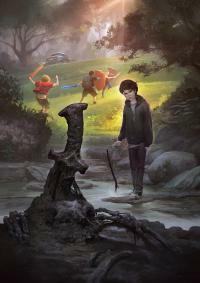 The sword just stayed there, tempting him, looking like a carved piece of rock itself. He stared at it, trying to figure out a way to draw it from the ground. He tried throwing other rocks at the sword, but they bounced off. Sticks used as levers snapped instead. He had nothing to dig with, and the ground was too rocky anyway. Finally, defeated, he gave up. He walked as straight as he could back to the park, hoping to remember a path to return to the sword. Mark arrived at the park and noticed that he wasn’t far from where his mother had dropped him off. He looked at the trees and memorized the ones on either side for the path entrance. Then, he went up to the parking lot to wait for his mom. She came back about ten minutes after rhetorical got up there. “Did you have fun today?” she asked as he got into the car. Mark smiled and started making plans to retrieve the sword.